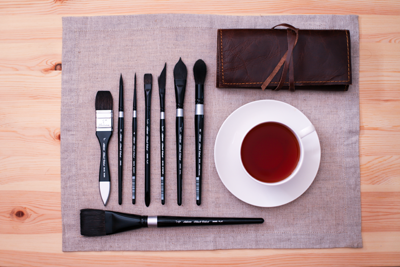 These distinctive black lacquer handled brushes with a signature silver band are a water-based artist’s dream! The Black Velvet® series is made with a blend of natural squirrel hair and black synthetics that allows the brush to hold a huge amount of color and release it with perfect control for watercolors, gouche, liquid acrylics, inks and dyes. 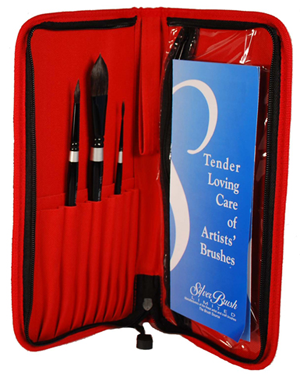 The bristles are simultaneously soft enough to allow multiple-layer glazing without disturbing previous colors, yet firm enough to lift color with a gentle scrub. 3008S series features a specially engineered black acrylic handle with beveled edges for scraping and separating paper from watercolor blocks. *Please note that sizes 1¼” and 1½” have a wooden handle while other sizes have an acrylic handle.